Vegetable Gardening with Mike the Gardener: What is an assassin bug? Reduviidae (from the contained genus, Reduvius, which comes from the Latin reduvia, meaning "hangnail" or "remnant") is a large, cosmopolitan family of predatory insects in the suborder Heteroptera. 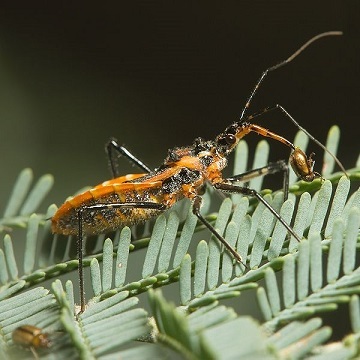 It includes assassin bugs (genera include Melanolestes, Platymeris, Pselliopus, Rasahus, Reduvius, Rhiginia, Sinea, Triatoma, and Zelus), ambush bugs (subfamily Phymatinae), wheel bugs (Arilus cristatus), and thread-legged bugs (the subfamily Emesinae, including the genus Emesaya). There are about 7000 species altogether, making it one of the largest families in the Hemiptera. This is a beneficial insect. DO NOT TREAT!